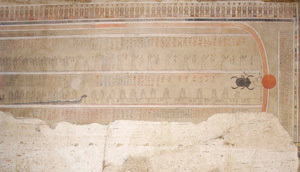 The tomb of Amenhotep III is located in the western branch of the Valley of the Kings and is now numbered as KV 22. As the foundation deposits in front of the tomb contain faience plaques inscribed with the name of Amenhotep III’s father, Thutmose IV, it is likely that the tomb was originally constructed for Thutmose IV, but he had to change the plan for his burial probably because he passed away before the cutting of KV 22 was completed to accommodate his burial. Thutmose IV however, was eventually buried in KV 43. Ultimately, it was Amenhotep III who was buried in KV 22 as his final resting place. The basic tomb plan follows that of its immediate predecessors with the principal exception that the entrance to the burial chamber is not on the main axis, but at one end of a side wall of the antechamber. It has also two pillared chambers opening off the crypt of the burial chamber, each with its own annex. That at the end of the chamber, Room Je, seems to have been originally intended for the burial of Queen Tiy, although ultimately she appears to have been buried in the Royal tomb at Amarna. The second complex, Room Jd, on the other hand, preserves traces of enlargement out of the standard subsidiary chamber. As a later addition to the tomb plan, it has been assumed that the chamber was intended for Sitamun, Amenhotep III’s eldest daughter who obtained the title of Queen in the first sed festival of Amenhotep III. Since the official discovery of the tomb by two members of Napoleon’s expedition, the funerary objects of Amenhotep III have been brought to Europe by scholars and visitors. Many objects, mainly stone shabtis found by Napoleon’s expedition, were drawn in the Description de l’Egypte and exhibited in the Musée d’Louvre in Paris. Despite a superficial clearance of KV 22 said to have been carried out by Theodore Davis, the first scientific archaeological works were undertaken by Howard Carter under the sponsorship of the fifth Earl of Carnarvon from February to March in 1915. The finds by Carter’s excavations are now stored in Highclere Castle in Newbury and the Metropolitan Museum of Art in New York. Although Howard Carter noted that he made a complete clearance of the tomb, heaps of debris containing small fragments of the funerary equipment still remained inside and outside of the tomb when the Waseda University team started clearance. In 1989, Waseda University began working at the tomb of Amenhotep III in the Western Valley of the Kings. This project was a logical follow-up to our previous work on the monuments from the time of Amenhotep III. 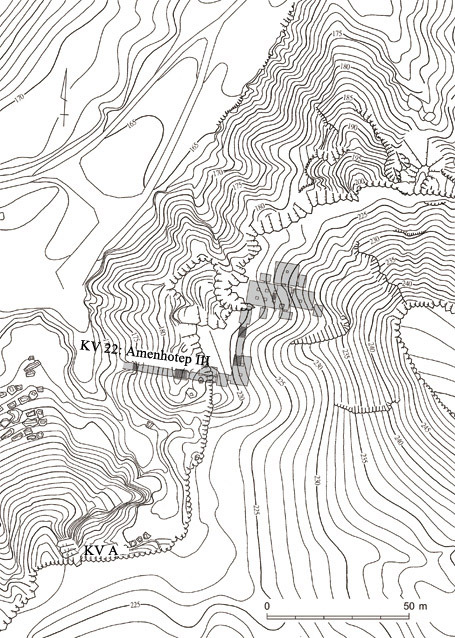 Before clearance of the tomb, we surveyed and made a 1:1000 topographical map of the Western Valley of the Kings, as there was no reliable map of this area. A complete clearance of the tomb of Amenhotep III was carried out in order to make a tomb’s exact plan and elevations. According to its elevations, this tomb is cut into a sloping hillside, 172m above sea level. The floor level of the sarcophagus chamber is about 145m above sea level. The distance from the entrance to the rear wall of the sarcophagus chamber is approximately 85m. 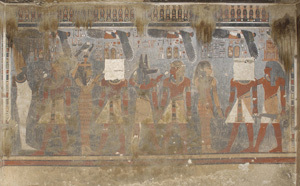 The plan of the tomb of Amenhotep III is similar to those of the tombs of Amenhotep II (KV35) and Thutmose IV (KV43). Seventy five years after Howard Carter’s clearance, a number of objects were uncovered during our re-clearance. The outside of the entrance of the tomb was excavated in order to investigate the traces of Carter’s excavation. In the course of the work, we discovered a small intact foundation deposit on the south section of our trench. The foundation deposit consisted of the head and small bones of a calf, five miniature pottery vessels, a wooden model cradle and a wooden carving of a symbolical knot. They were placed in a reed basket, about 25cm in diameter. With the calf’s head placed on top of the deposit. 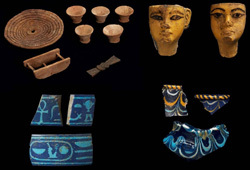 Also, both inside the tomb and debris of former excavators left outside the tomb, we found a number of objects that were Amenhotep III’s funerary equipment. Most of them were fragments, but they will provide some important information on the original burial assemblage of the tomb of Amenhotep III. An interesting graffito was observed between the antechamber and the staircase leading into it, written in black on the east wall. 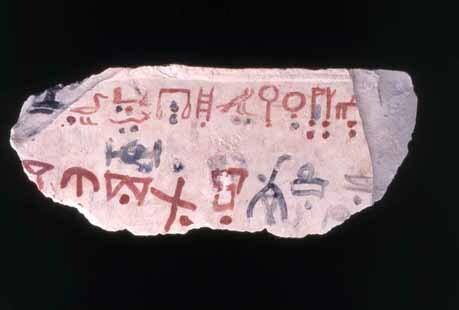 It reads: ‘Year 3, 3rd month of Akhet-season, day 7.’ Although the docket’s precise significance is uncertain, the paleography appears to be contemporary or sometime in the late Eighteenth Dynasty. The purpose of this graffito is still controversial, but it is at least possible that the text was written at the time the tomb was closed. We also conducted a clearance of a small rock-cut chamber called KV-A located approximately 60m to the south of the tomb of Amenhotep III. It retains much of its original blocking, and in the single chamber behind had been stored a number of pottery vessels. Some of them bear dockets bearing dates of Year 32 and Year 37 of Amenhotep III. Ostraca and tools for the construction of tomb were also uncovered. 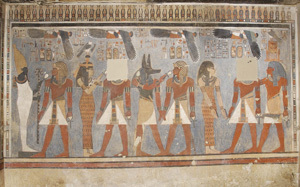 The tomb of Amenhotep III is decorated with elaborate paintings with very high quality. However, the quality of these paintings has been compromised by their precarious condition. First, the wall paintings are badly stained by guano of bat and micro-organisms on all over places. Secondly, the surface of the painted plaster has been detaching itself from the bedrock, which causes the corruption of the painted plaster. Thirdly, cracks on the walls and pillars have caused severe damage, especially as some pillar are about to collapse. Forth, some artificial damages were made on the wall paintings in the past. It was realized that the wall paintings of the royal tomb of Amenhotep III are in a seriously perilous state. They will collapse unless urgent conservation works are undertaken. Indeed, the further deterioration of these wall paintings would be an incalculable cultural loss for humanity. Thanks to Japan Funds in Trust through UNESCO, we carried out a comprehensive conservation intervention on the wall paintings of the tomb of Amenhotep III. The team consisted of Egyptian, Italian, and Japanese conservators. We have conducted two long-term campaigns so far and the campaigns were very successful. The result of conservation work on the wall paintings made difference in appearance as well as stability. The conservation work has contributed not only for the preservation of the monument but also is an academic contribution to Egyptology. Now we are preparing the third long-term campaign which will complete our conservation project. It is hoped that the result of this very important project will be greatly appreciated by many people in the world. 1990 Hieratic Inscriptions From the Tomb of Amenophis III. Orient 26 (1990), pp. 94-104. (= Studies in Egyptology). London, pp. 41-54. Arizona Egyptian Expedition, pp. 25-33. Yoshimura, S. and Kondo, J. 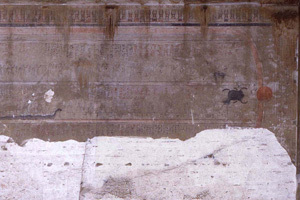 1995 ‘Excavations at the Tomb of Amenophis III.’ Egyptian Archaeology 7 ,pp. 17-18. Antiquités de l’Égypte 78, pp. 205-209. Nekropolenschreiber.’ Göttinger Miszellen 160 (1997): 51-58. Capriotti, G., Kawai, N., Nishisaka, A., and Yoshimura, S.
Amenophis III (KV22) in the Western Valley of the Kings : 2001-2004 seasons,’ Memnonia 15, pp. 203-212, pls. XLV à XLVII. 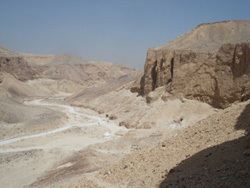 2008 Research in the Western Valley of the Kings, Egypt-The Tomb of Amenophis III (KV22)-, Tokyo.